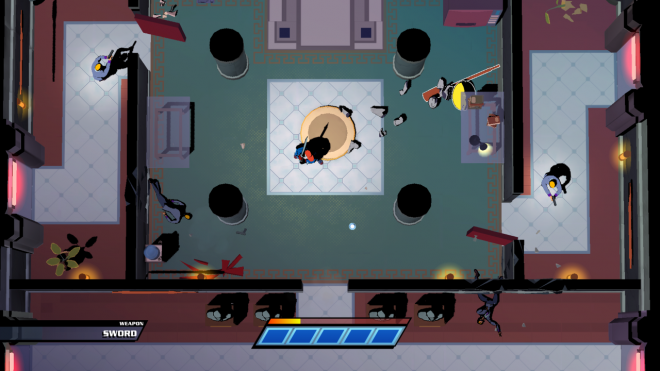 Mr. Shifty is an action game that takes some obvious inspiration from superhero comics, yet has you playing as a person with one of the worst superpowers ever. The titular hero can teleport, but only at a very short distance in front of him. He instantaneously appears somewhere it would only take him two steps to reach normally, which when you think about it isn’t that impressive. Granted, the power does come in handy the context of the game’s grand heist inside a heavily guarded, booby-trapped super-villain skyscraper. He can shift through walls and past laser grids, as well as get the jump on unsuspecting guards. 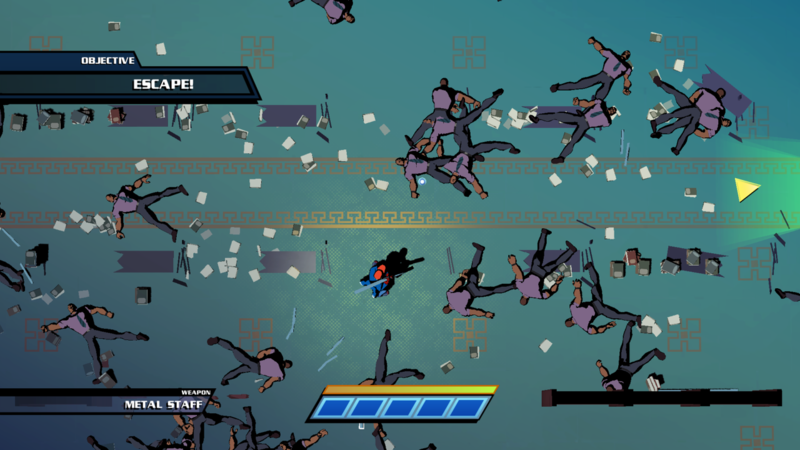 Mr. Shifty’s power isn’t all that compelling on paper, but in practice it is pretty fun. Holy shift – The shifting mechanic is pretty simple; press A, and you’ll instantaneously appear a few feet directly ahead of where you were facing. A small marker is always pulsating in front of Mr. Shifty’s face, so you know exactly where his shifts will land him. Any solid or deadly objects between your starting and ending points will be ignored, allowing you to effortlessly jump to a different room or dodge enemy attacks. You can shift up to five times in rapid succession, followed by a short cooldown. Shifting is quick, precise and satisfying as you disappear and reappear in puffs of smoke. It’s akin to jumping in most platformers – it’s a vital means of navigation that quickly becomes second nature. 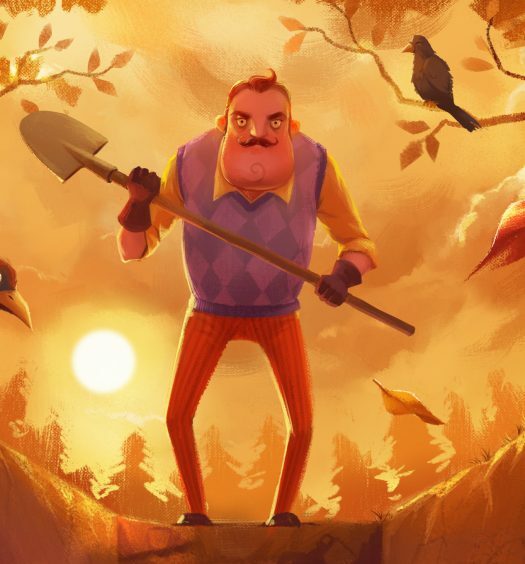 Punch a bunch– Teleportation isn’t Mr. Shifty’s only skill; he’s also a pretty strong fighter. 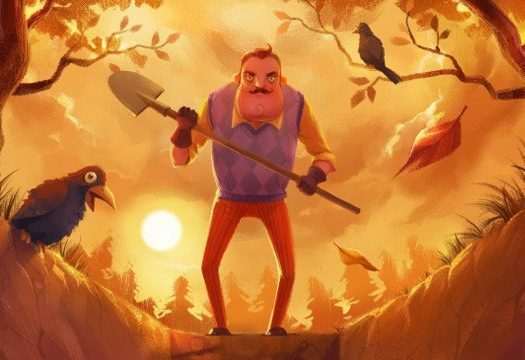 While the top-down perspective lends itself to being a shooter, you only use melee combat – while most enemies get guns, Shifty has to knock out everyone with his bare hands. He can pick up blunt items to help him in combat, which he will swing and/or throw at enemies for an instant kill. Most weapons will break after use, leaving fists as your go-to weapon. Combat is all about movement, shifting in and out of danger while quickly dispatching foes. While the same strategy is used to take out most enemies – get behind them and punch – there’s a wide variety of enemies with different behaviors that can make taking them out tricky, especially in groups. 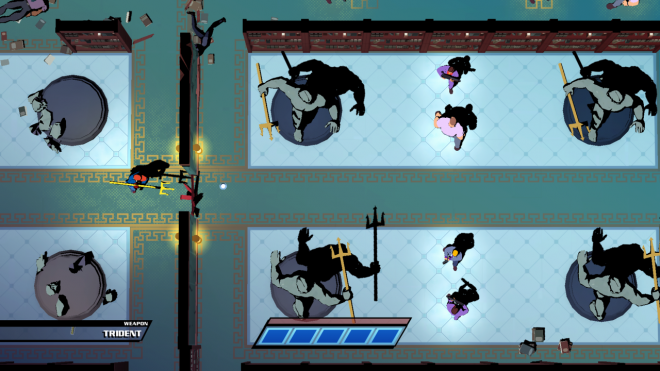 Any bullets that connect are a one-hit kill for Shifty, but if you take out enough enemies in a row, you’ll be granted a temporary slow-mo power-up that kicks in right before a killing blow connects giving you the ability to make some matrix-esque dodges. Floor plans– Only able to shift and fight, Mr. Shifty, may sound like a one-trick pony. However, thanks to an amazing series of levels, the limited move set never gets dull. Every level is presented as a floor of the villain’s hideout, and the closer you get to the top the stronger the resistance gets. Shifting will be used for a little bit of everything, from stealth to combat, from chase sequences to puzzle solving. New elements are always being added, making each level feel fresh and different. From beginning to end the game is constantly coming up with new scenarios, providing a wide variety of experiences that both complement and challenge the protagonist’s abilities. The true villain – The game has the tendency to slow down when there’s too much going on, but it does take a lot to get that to happen. We’re talking hordes of enemies with gunfire and explosions causing insane amounts of chaos. It’s pretty rare in the early goings of the game, but once you reach the final third, it happens quite a lot. It completely ruins what had all the makings of a thrilling conclusion, throwing a game about speed into a vat of molasses and makes some otherwise cool set pieces borderline unplayable. In the oddest instance of this glitch, the game also gets overwhelmed on the level complete screen if you finish with a time over ten minutes. Bumpy ride – While the level design is great and scales in difficulty pretty well, that doesn’t mean it’s flawless. Every once in a while they throw in a random moment that feels too difficult for its own good, like unbalanced combat trials in or navigating a barrage of fast-moving lasers. Respawning is quick, and checkpoints are generally well-placed, triggering whenever you enter a green door, so at least dying isn’t at a terrible cost. Mr. Shifty is an incredibly fun send-up of superhero comics and action movies, complete with bright colors and cheesy dialogue. Its unique gameplay hooks are a blast, delivering a solid mix of fast combat and creative navigation. If it weren’t for the technical issues that plagued its final levels, this game would easily be a must buy. Hopefully, it will get patched in the future so these problems can stop bogging down a great game. 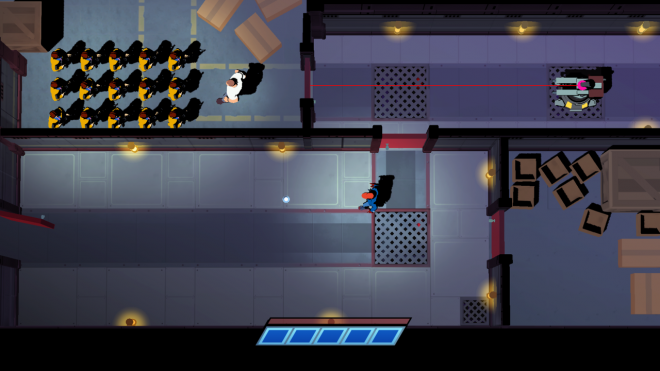 Mr. Shifty was developed by Team Shifty and published on Xbox One by tinyBuild. It was released August 4, 2017, for $14.99. A copy was provided by the publisher for review purposes.